This slots game has a seemingly random theme. The symbols are a mix of fruit, numbers, a bar and a bell. It has a bit of a futuristic, industrial look about it. As there are five different virtual machines in the game, it also has five different colour schemes, one for each game. Barcrest, are a wholly owned subsidiary of the Scientific Games Corporation a massive company based in Nevada. Their claim to fame is the introduction of the first secure, instant lottery ticket in 1974. Barcrest develops slots machines for a predominantly U.K and European market. Their games are renowned for having generous RTPs. What differentiates this pokies game from others, is its Hot Slot game type. There are five, five reel slots. They are all fundamentally the same as far as layout it concerned. There is a spin button on the bottom right on the panel and an option to raise and lower the bet. Boxes on the interface display all the relevant information. There is not much animation in the game and it also is aesthetically a bit cluttered, but as there are five different games going on this is understandable. This game uses 5 sets of reels which run parallel. The easiest way to explain it, would be to say, that this game has five different virtual machines, which all spin every time the player presses the spin button. One of these games, has an average payback of over 100%, this is the Hot Slot. The other slots will still win but at lower player pay back percentages. The player has an incentive to correctly guess which one is the Hot Slot. Small squares at the top of the interface, preview the other games to help the player, chose the correct game. The games displayed, at the top of the screen are also ranked, according to which slot has paid out the most. There are 10 winning lines in total, on all the games. Apart from having five games in one, this slots game does not have many special features. 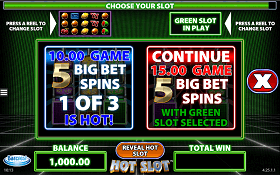 Big bets play five consecutive spins and do not allow the player to change the bet, but also change the likelihood that they are playing the Hot Slot. The maximum pay out for this game is 250x the player’s wage which is a decent Jackpot. When playing on the hot slot, the player has over a 100% pay back rate and a lot of little wins can turn profitable very quickly. This slots game is a novel concept, and is worth a play. The graphic and aesthetics are not the best and it is a little bit lacking on features, but when the going is good, it is really good in the game. The five game concept, puts the player in shoes of old slots veterans who’d operate four machines at a time, to try win big or lose everything faster. The advantage of this online version is the player only has to bet on one game. It is worth a play, just to try out, the five in one game concept.